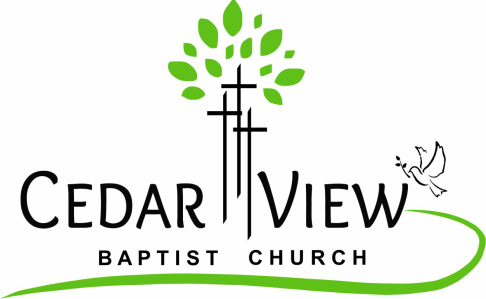 Cedar View Baptist Church is a gospel-centered, Southern Baptist Church located on the south side of Olive Branch, MS. We purpose to exalt Christ in every aspect of church life and in the everyday rhythms of our members on mission. Healthy relationships are key to being a unified family on mission. As we grow in our faith in Christ, we ask the hard questions and wrestle with life's struggles, all the while looking to Christ for true transformation. This is the essential, corporate gathering of the church with all attention turning to our Triune God through prayer, praise, and Gospel proclamation. Sunday Worship is the best introduction to our church. These gatherings are less formal and often lead to great discussion. Deepened appreciation for God's Word and for doctrine produce daily application of biblical texts and topics. Once per quarter we meet to discuss church decisions. Our priority on Wednesdays is prayer. We lift up the names of people in need, missionaries, the lost, neighbors, leaders, and seek God's direction for our church. Our beliefs are in agreement with the 2000 Baptist Faith and Message. In early 1963 a group came together on property at the corner of Mississippi Highway 305 and Dunn Lane East, later to be named Stewart Rd. in honor of Mr. Bob Stewart, to form a church, the group that would later become the twenty-four charter members held their first service on Easter Morning 1963 in a building already existing on the property. The first service was led by Billy Whitten, who served as lay speaker until our first pastor, Davis Ramsey was called in September 1963. In the months that followed there was an effort put forth to organize and constitute a church. Rev. Ervin Brown and Rev. Clyde Rogers assisted the soon-to-be congregation/charter members to form Cedar View Baptist Church. We were constituted on August 11, 1963. To help Cedar View, the Cedar View Congregational Methodist Church, which no longer existed, deeded one square acre to the trustees of Cedar View Baptist Church. Another half acre was deeded to Cedar View in August 1982 which gave us one & a half (1 1/2) acres of property. In May of 1965 a building committee as elected to begin plans for building a much needed educational building. These plans became a reality and by the Fall of 1966 the building was completed and in use. Then in February 1968 during a regularly scheduled business meeting, the church approved a "special offering" for the third Sunday of each month designated as a building fund for the future construction of a new sanctuary, the first service was held in the new sanctuary in August 1974. In 1986, a new fellowship hall was added onto the back of the sanctuary, which was named in honor of Rev. Reed Caldwell. 1988 saw the need for more classroom space and a mobile classrooms were rented from the Northwest Baptist Association, now known as Extended Missions Network. More changes and growth were coming and on May 9, 1993 the members and pastor of Victory Heights Baptist Church in Memphis, TN became part of Cedar View Baptist Church. With the merger, we also gained another pastor, for the first time in church history we had two pastors who shared the pastoral duties; Rev. Bob Mizell and Rev. Ed Schulker shared these duties until Rev. Mizell retired in December of 1994. Also with the merger, the membership doubled and the need for more educational space was needed, in mid-summer of 1994 a new educational building and fellowship hall was completed, the fellowship hall was named "Victory Hall" in Honor of Victory Heights Baptist Church. With Cedar View's 50th anniversary in 2013, we have only missed one Vacation Bible School, and it was due to the construction/remodel of our educational spaces; however, we rebounded in 1995 with an enrollment of 126 and the largest VBS in the history of Cedar View was in 1997, with an enrollment of 194. In 2004 or 2005 we started remodeling our sanctuary, it began with the removal of the foyer and enclosing and converting the front porch into a foyer. Then in 2007 we remodeled the stage and choir area, by taking out the "corners" that were on either side of the choir loft to allow more choir and stage flexibility.